- It has an excellent cutting ratio of 2.5 acre per month and are capable of cutting up to a height of 1/2'-12". We are remarkable entity, engaged in offering superior quality Rotary Slashers. A. Align the shrub master so as to bring the lower arm of tractor in line with the pins provided on either side. Insert the lower arm into the pins by pushing the lower arm and lock the free end of the pin with the lynch pins provided. Our Shrub Cutter is a tractor driven equipment. 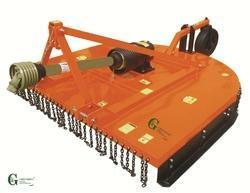 Our Shrub Master or Rotary Slasher is made up of 10 gauge MS sheet with 1.4 meter rotary blade. The blade is made up of high carbon steel. Our Shrub Cutter is highly efficient and easy to work with. We provide our Shrub Cutter at market leading prices. Description : Rotary Slasher has a rugged frame and heavy duty gear box along with reversible steel blades to easily cut through wild grass, weeds, shrubs, sugar cane stacks etc. Suitable for any tractor with 50-80 HP and P.T.O of 540 rpm with a three-point-linkage. Available in widths of 6 or 8 feet. With an aim to establish ourselves among the leading organizations, we are engaged in providing a wide range of Shrub Master. We are offering our clients with junior jungle king tractor driven implements at highly competitive prices. These have an excellent cutting ratio of 2.5 acre per month and can cut up to a height of 1/2'-12". We are engaged in offering Rotary Slashers. Easily cuts thick and tall weeds and grass. Offers adjustable grass cutting height upto as low as 25 mm. Highly useful for cutting rough & tough shrubs spread in large area. 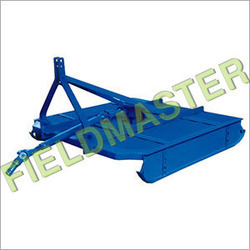 Essential equipment for levelling large areas of uneven grass or park lawn. Rotary Cutter / Stub-Cutter /Grass Cutter (Lawn Mower) The Grass Cutter Mower Horizontal Slashing is the most versatile method of grass cutting. Rotary Slasher is powerful enough to cope with tall weeds and small bushes, yet giving a satisfactory fine cut on turf areas mounted with optional rear tyre, scalping is minimal. The Rotary Slasher is provided with collapsible cutting blades, which rotate on swivel joints when the strike across an obstacle.